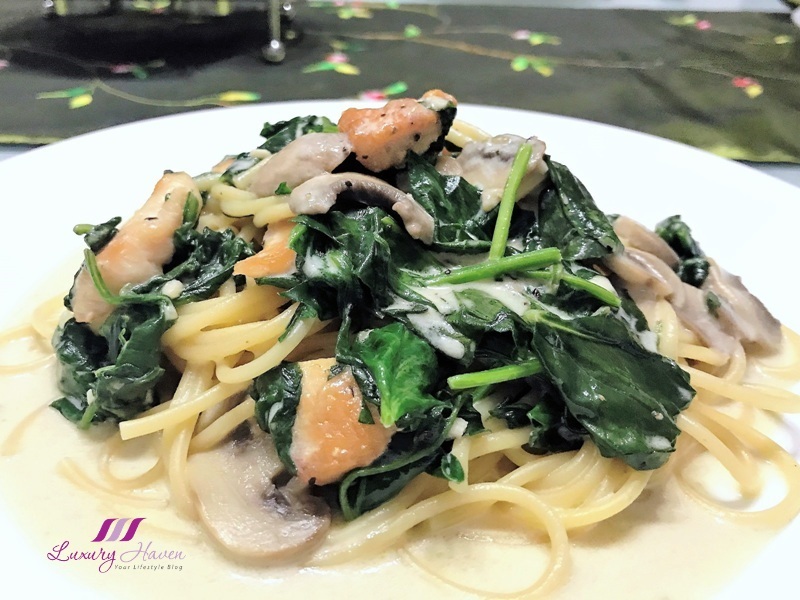 Creamy Chicken Pasta with Baby Spinach, Tasty Treat For All! 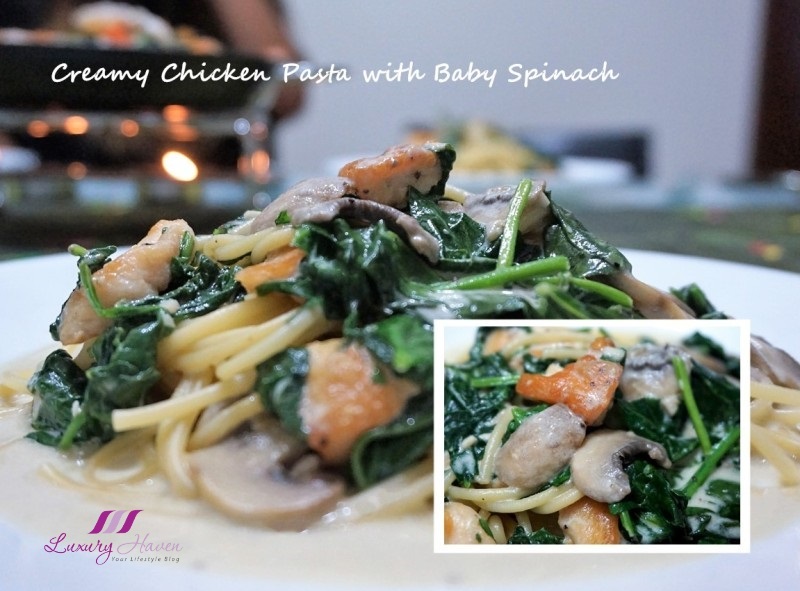 You are here:Home » Recipes » Creamy Chicken Pasta with Baby Spinach, Tasty Treat For All! If you are a fan of Carbonara Pasta, you will love this creamy pasta with strands of spaghetti and slices of white button mushrooms enveloped in a delectable Emborg Cream sauce. Paired with pan-seared golden brown Chicken bites and healthy Foglia Sublime Baby Spinach, this Italian recipe is a must-try! I am fan of Foglia Sublime greens, specializing in a variety of salad from Azienda Agricola Altamura, available in the local supermarkets. Baby spinach is harvested earlier, hence the small leaves and more tender and sweeter taste in comparison with mature, fully formed spinach leaves. Try cooking this Tasty Creamy Chicken Pasta with Baby Spinach this weekend! 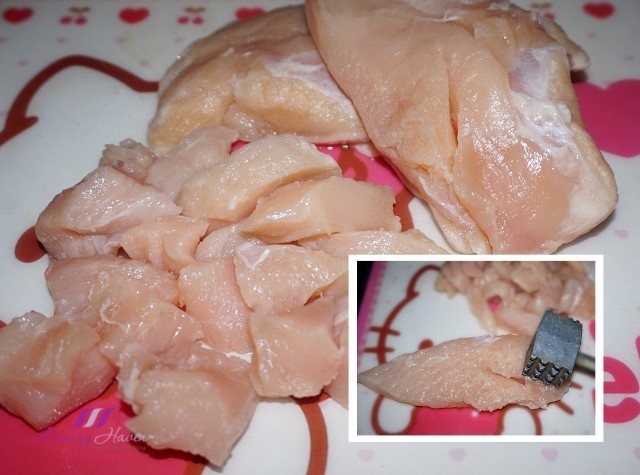 Tenderize the chicken fillet by using a Meat Tenderizer Mallet. Slice into cubes. 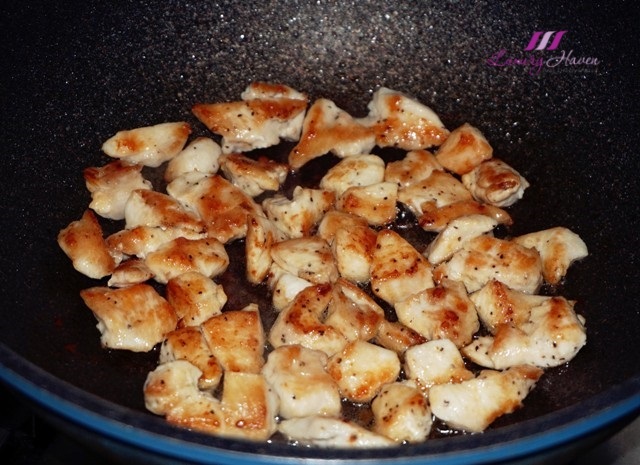 Marinate chicken with seasonings for about 15 minutes. Rinse and slice button mushrooms. Cook pasta according to instructions on package, and set aside. Heat oil and pan sear both sides of chicken till golden brown on medium heat. Lower fire, drain and transfer to plate. 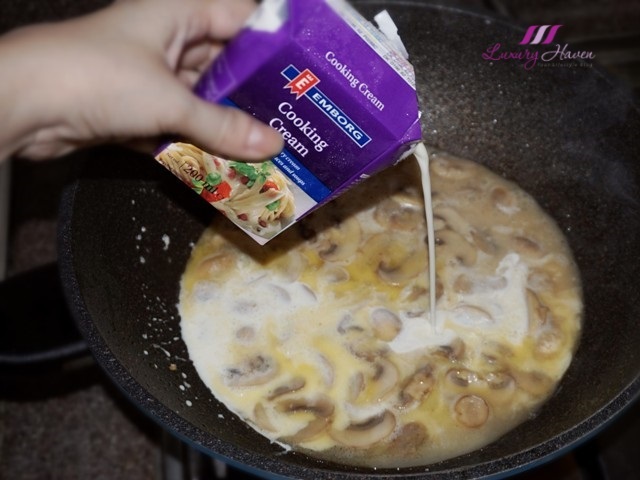 Add butter and sauté mushrooms for couple of minutes. Add cooking cream and wine. Rinse baby spinach and throw into pan. Add chicken next and mix thoroughly. Stir in pasta and blend well. Dish out pasta onto serving plates and serve your Tasty Creamy Chicken Pasta with Baby Spinach! 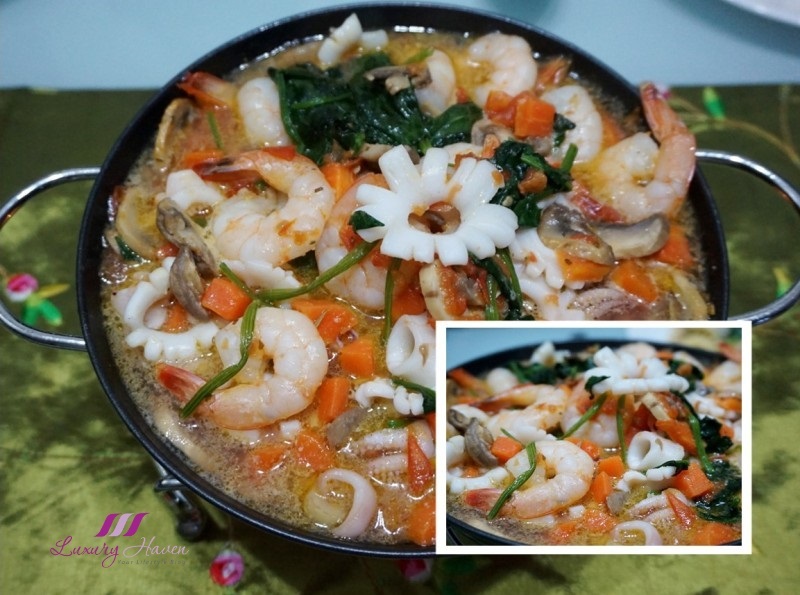 That evening, we also paired our Italian pasta with the Delicious Shrimps Ahijo ( ダイソーオーマイアヒージョの素 ), but adding different ingredients such as carrots and squid. 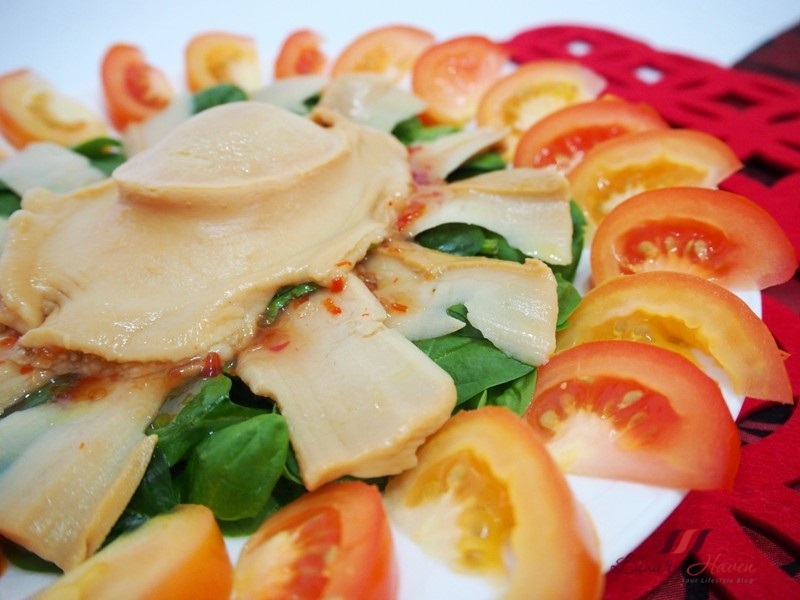 Also a fan of Baby Spinach but lazy to cook, try this Festive Thai-Style Abalone Salad with Italian Baby Spinach! Satisfaction guaranteed! Love collecting souvenirs or planning a trip to Malaysia? 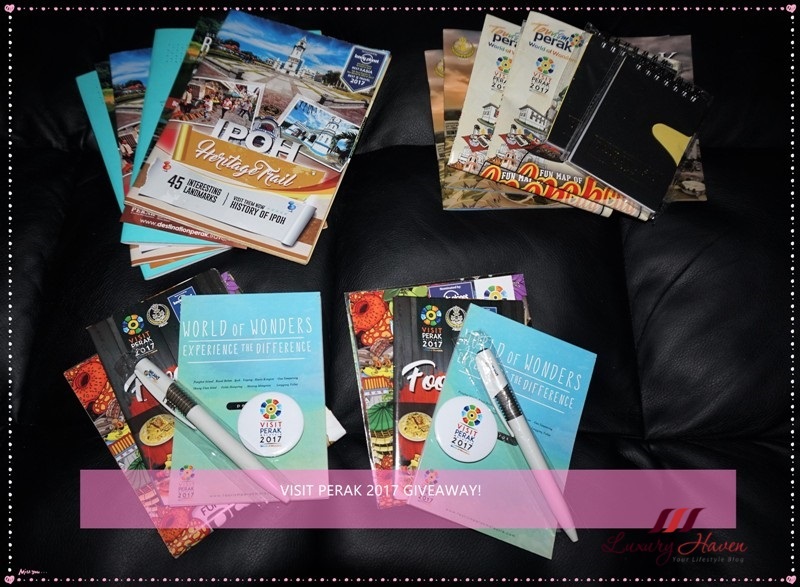 Try your luck to win these prizes at Visit Perak 2017 Souvenirs Giveaway! Open to All Worldwide! I would love the chicken and spinach, without the pasta! It looks delicious! I am really a big fan of Carbonara Pasta! Your cooking is always delicious. I love Emborg cream. I love carbonara pasta, one of my favourite sauce for pasta. Not really a fan of pasta itself, but this one is twisting my hunger upside down. Everything looks so delicious ! This looks wonderful, Shirley!! Even picky Bill would love it! 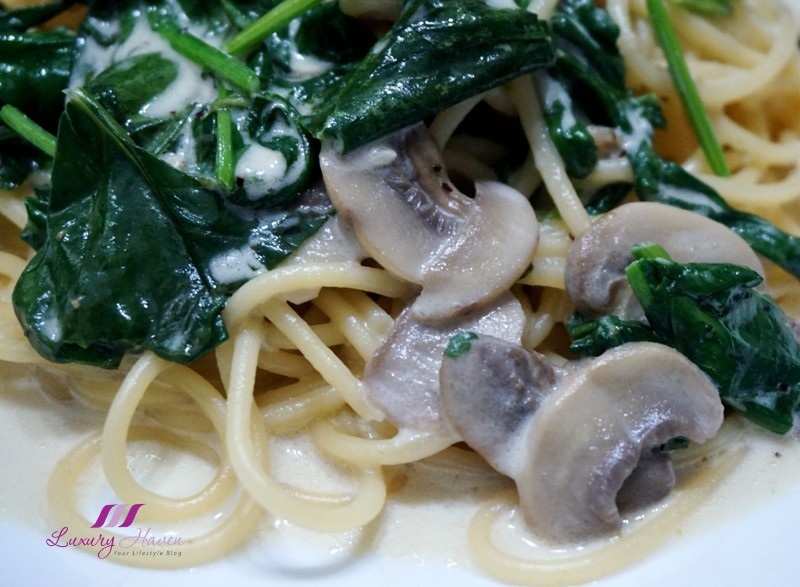 That's a very delicious combination with Chicken, White Mushrooms and Baby Spinach. Thanks for your tasty recipe! Sounds so tasty, great job! this looks so delish and i am not a veggie person! hehe =) YUMMY! I wanna taste this, i'm craving! This is my favourite recipe on Luxury Haven so far - yum! Delicious creamy chicken pasta!! This is my type of meal. This disk looks absolutely gorgeous. I adore food like this, so this would be perfect for me. This looks lovely, and I bet it's even lovelier to eat! Man, this is making me hungry. OMG! That look so tasty and creamy. love! Hey! This doesn't look that hard to make! I'll see if I can find some time for this guy. Love how you prepare your pasta sauce from scratch instead of using bottle or canned pasta sauce - so much healthier!